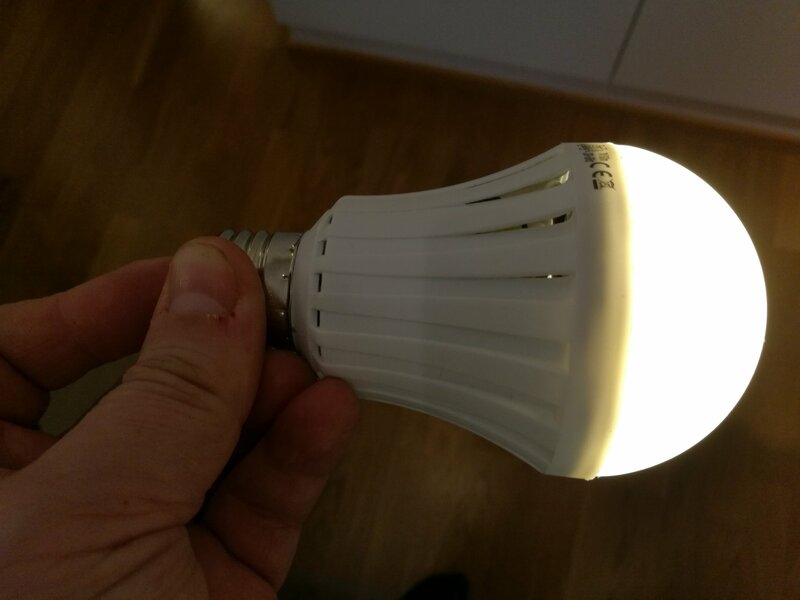 I got several LEXXA 7W LED-VARAVALO bulbs in hoping to replace some aging LED light bulbs with new ones that have a bonus feature: They have an internal battery that allows them to output light even when the mains power is turned off. 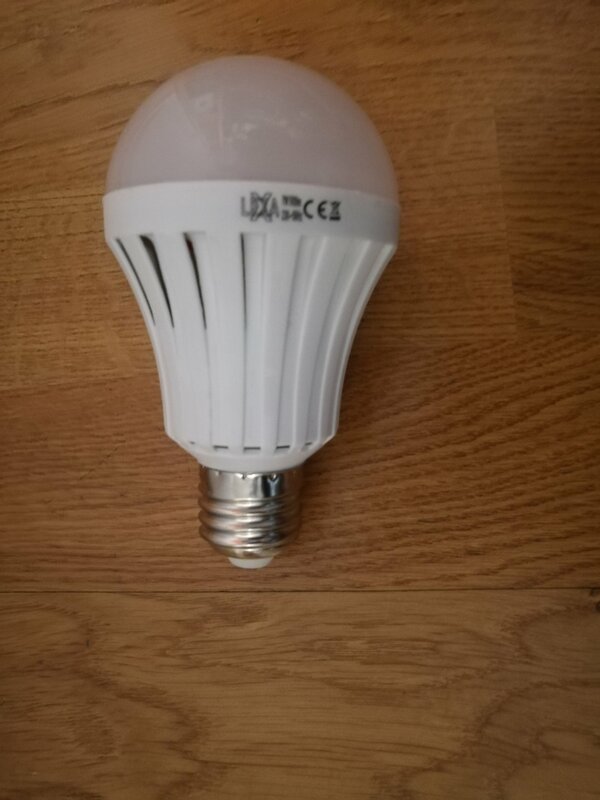 Those were available cheaply from Finnish shop Motonet (bulbs with pretty similar look and similar features are also in Amazon). The marketing promise is good: LED bulbs with integrated lithium-ion battery can provide up to 5 hours lighting during blackout and power outage. 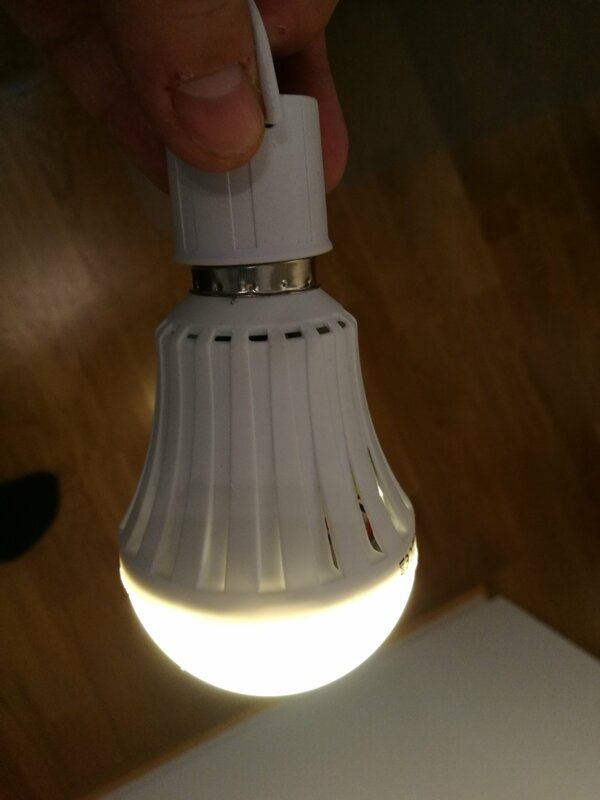 White LED light bulb functions like a regular LED when connected to household electricity. Bulb can be activated in the event of a sudden power outage from normal light switch. The light bulb can be used as flashlight for home or outdoor (comes with switch socket for that). I could even turn o the bulb with my fingers! When the resistance was from short circuit to 470 kilo-ohms, the bulb was fully on. When the resistance was one mega-ohms, the bulb gave some very dim light. With bigger resistance values, no light output. I also measured that the bulb pushes out around 2.5V DC (open circuit voltage, plus on center of base) to the bulb base to try to detect if the light switch is closed or not. The output current is very low, about 3.3 micro-amperes to short circuit. To this point good. Good idea, but it is failing on one big issue: it does not always reliably turn off when the light switch is turned off. This is pretty annoying. 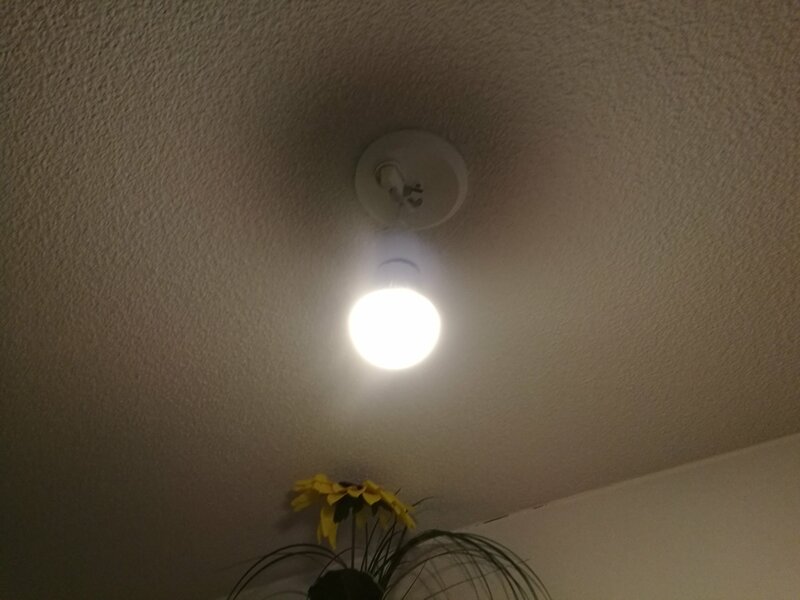 When I want to turn off the bulb, it could turn sometimes off, sometimes does not turn off, sometimes gives some dim light then turned off. Very annoying and will use the stored energy (that should be there for emergency). What causes this issue? 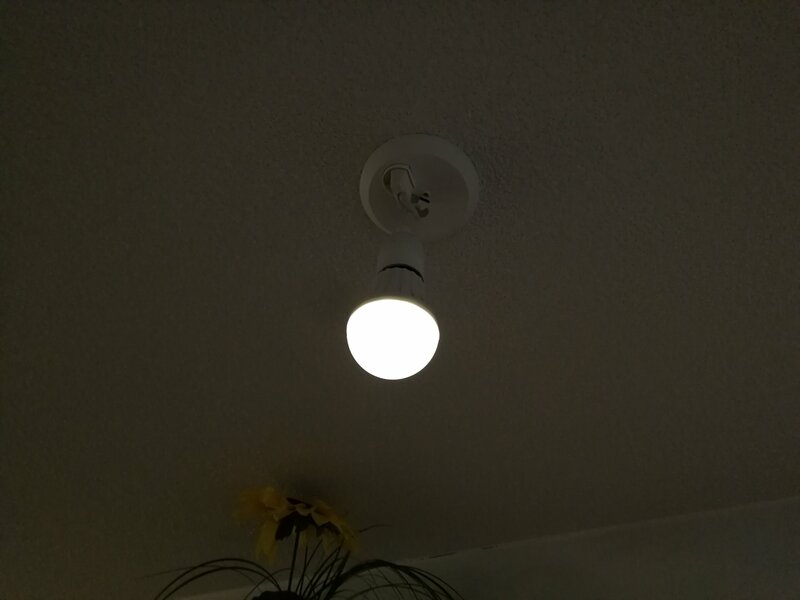 I tried the bulb on several lamps with wall switches. Pretty much same results. And this was a new house I tested with wiring made well. No other load on those light circuits. Tested on two light circuits. 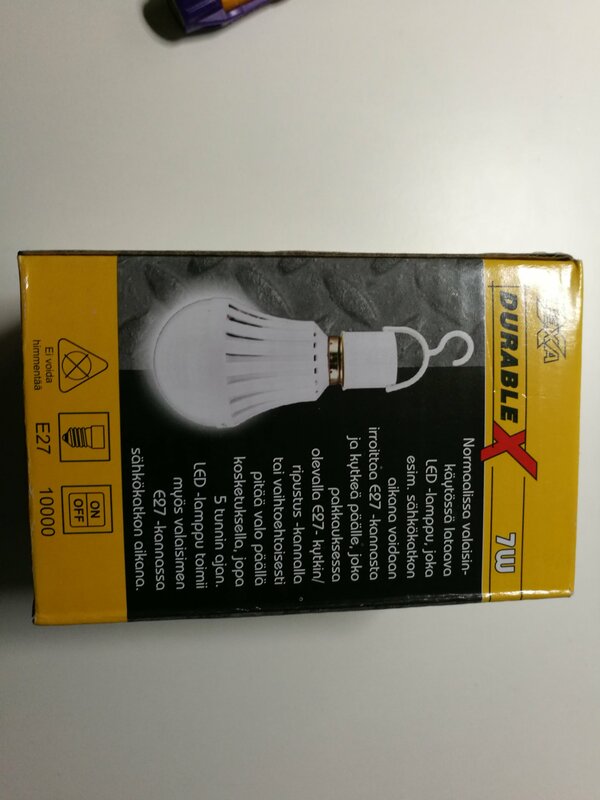 Tested with two different bulbs. All this to eliminate that there was a single mistake (bad lighting circuit wiring or damaged product). Then I took the bulbs to the lab and made some measurements. I tested ow the bulb reacted to AC frequency (50 Hz) signal coming from bulb base into bulb. I noticed when then AC voltage goes to around 3V RMS, the bulb turns dimly on (consumes power from internal battery) and then AC voltage reaches 3.5V RMS the bulbs turns fully on (to brightness it operated normally from internal battery). So this indicates that getting few volts of noise on incoming wire can turn the bulb on. I tried to measure the input resistance and capacitance of the bulb to low voltages: the resistance seems to be infinite to several mega-ohms and capacitance was 27 pF. At this high impedance input on the bulb to sense something, it is no wonder that it can pick up few volts of noise on floating mains wires in mains wiring bundle. This product does not seem to have robust enough design for reliable operation in real-life use cases I have. I was not satisfied with the results. Those bulbs are not very useful to me. Not completely useless (they work as flash lights), but not very useful. If those were built with more robust detection circuit, those builds could have been very good. Verdict: Not recommended because bubs fails to often turn off properly when it should. Interested on the tear-down of this type of lamp? Inside an “intelligent” emergency lamp with schematic. I have to admit that this is a very clever idea. It’s a standard LED lamp with the addition of a lithium cell. In normal use it charges from the mains while lit, but in the event of power failure it will light up automatically, but only if the wall switch controlling that light is on. That basically means you can turn it on and off from the light switch even when there’s a power cut. It does this by applying a small DC voltage to the lamps contacts and detecting if it is bridged. If the wall switch is off then no significant current will flow, but if it is on then current will flow through other appliances and circuits in the house and it will detect that and light. This does mean that it can only really be used in a single lamp holder on its own, and the switch can only be a simple one with no active electronics. A look inside a 1W LED emergency light. The video also has my take on the cheapest and possibly tackiest Chinese style emergency light circuit possible. Like a challenge to design an emergency light with the minimum amount of components possible. But in my last-minute addition there’s a design flaw. With the LED in series between the switching circuit and the cell, the voltage available to turn on the transistor would be so low that it would probably allow the LED to glow, but not light fully. Now an LED light bulb with a battery in the base isn’t exactly rocket science, we can understand the product conceptually at a glance. But as they say, the devil is in the details. we can be fairly sure it will contain two separate arrays of LEDs: one low set for battery, and a brighter set to run when the bulb has AC power. As expected, there are two concentric rings of LEDs in the array which turn on or off depending on whether the bulb is on AC or DC power. The white connector on the top side of the board connects to the 3.7V 2000mAh battery, which incidentally takes up most of the internal volume of the bulb. Interestingly, the circuitry in the bulb is sensitive enough that if you hold the bulb in your bare hand it will see it as an unpowered circuit and light up. There’s some decent hardware in the bulb that might be worth the cost of admission, especially when these bulbs invariably hit the clearance section for $6 or so. The dual-brightness LED array and relatively beefy battery can be easily repurposed, for a start. Inside an “intelligent” emergency lamp (with schematic). Although I’ve featured this style of lamp in the past I’ve never done a full reverse engineer of the most common type. So here it is. It’s one of those products that achieves economy through clever tricks that take a moment to get your head around. So look for listings where they show someone bridging the cap with their fingers or with the screw-on switch cap to use it as a rechargeable work light. Crappy lead-acid LED lamp with brilliantly simply circuitry. This version of the now classic “intelligent emergency lamp” has the most minimalist circuitry seen yet, and what appears to be an SLA (Sealed Lead Acid) battery. In one area it has cut cost a bit too much and in another area it is fiendishly clever in using just a single transistor in its active circuitry.